What a welcomed return to the wizarding world. As I stepped into theater 6 at the Huntington 7 on opening night, I reminded myself to have low expectations for the Harry Potter spin-off “Fantastic Beasts and Where to Find Them.” You see, I had been let down the summer before by a J.K.-Rowling-inspired script called The Cursed Child, and I was preparing myself for the same with this screenplay, Rowling’s first. Pro tip: Don’t make the same mistake. “Fantastic Beasts” is a great addition to the stories fans identify with and have loved throughout the years. I had a few reservations about the setting change to the United States, and calling muggles no-majs took some getting used to, but the film was the perfect balance between familiar and new. The first installment in a five-part series about the magical creatures found in Harry Potter’s world is set roughly 50 years before the chosen boy’s birth. Potter fans will appreciate slight nods to a familiar: mentions of Albus Dumbledore, Hogwarts and the Lestrange family. Nostalgia is alive and well. 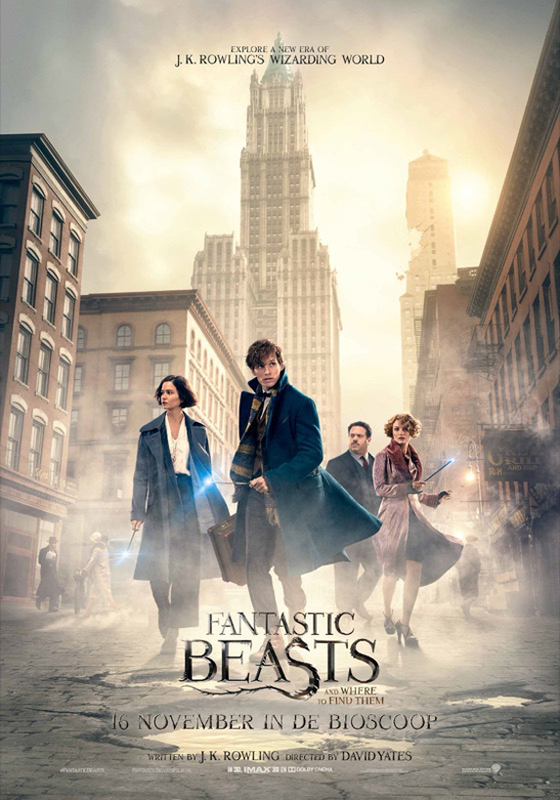 The film picks up as Newt Scamander (Eddie Redmayne), a British wizard, enters New York with a suitcase containing dozens of magical animals. As we have become accustomed to, not all is well in the wizarding world, even as we turn back the clock. Upon entering the city, he stumbles upon a speech from a member of the Second Salemers, a group determined to hunt witches and destroy them. While he listens, one of his creatures, a Niffler, escapes from the suitcase. And so our friend Newt’s adventure begins. His path soon crosses Tina Goldstein’s (Katherine Waterston), a Magical Congress employee and former Auror, and no-maj Jacob Kowalski’s (Dan Fogler), pulling them into the mayhem and into the world found in his suitcase. Newt’s escaped creatures, who are both adorable and frightening, are just a fraction of the problems the American magic sphere are facing in New York City. It’s 1926, and Gellert Grindelwald (Jamie Campbell Bower), a dark wizard second only to Voldemort, is at large. After making his mark in England, he’s moved on to America, where no-majs are noticing houses, streets, and buildings being destroyed by an invisible, indescribable force. The Magical Congress of the United States is on the defense, determined to keep their kind under wraps. As Newt and his new friends set out to collect creatures that escape in the confusing, they also find themselves at odds against the Magical Congress, who he tries his best to convince that his creatures are not to be feared. This film is subplots galore. No-majs are hunting wizards, the Magical Congress is chasing a child prodigy, and children are being mistreated. My major complaint is the impossibility that all the events happened between two sun rises. Maybe that’s a misinterpretation on my part, but I know even wizards need sleep. Perhaps Newt took an anti-sleeping draught. The climax pits Newt and company against an Obscurus, a dark magical force hosted by a child, the Magical Congress, and ultimately, Grindelwald himself. No one is safe in a battle that ends in oblivating the entire no-maj population of NYC. But is all the mischief managed? I’m happy to say it’s not. The first film was enough to wet my palette for more of this story. I’m invested in Newt’s story and his friends—particularly his interest in publishing his book “Fantastic Beasts and Where to Find Them,” which Potter fans will recognize as a textbook Hogwarts students will lug around in the future—and how Grindelwald will continue to wreck havoc. Johnny Depp, who makes just a cameo in this installment, is said to have a major role in the next—definitely an appearance I’m looking forward to. What role can’t this guy play? In the final scene, Newt departs from the U.S. with the promise to hand deliver a copy of his book to Tina when it’s published. I’m confident trouble will go wherever Newt and his suitcase of creatures goes next. And so will I.
Gine Eisenhut is a senior journalism and public relations major. This review reflects the opinion of the author only.